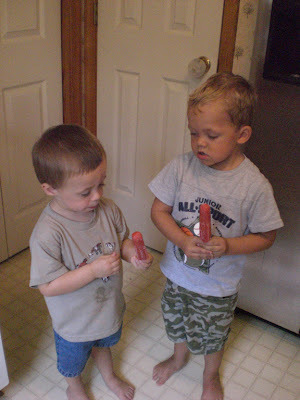 Seriously ... is there anything better than sharing a sweet cherry popsicle with a friend? Sam and his Mommy Carol came over for a playdate on Wednesday. While Sam and Griffin played with trucks, airplanes and helicopters ... Carol and I played with my Cricut machine ... we all had a blast. And ... Carol made some DELICIOUS apple/curry chicken salad for lunch ... yum!! Griffin adores flowers ... this past spring we had a patch of wild daisies sprout in our yard and he was in absolute heaven! This layout is all about my flower loving little boy. It's much brighter and cuter in person ... and so much fun to make! Yesterday I was very worried about Griffin. My little 6:00 am riser slept in until 7:45 ... that was quite unusual. 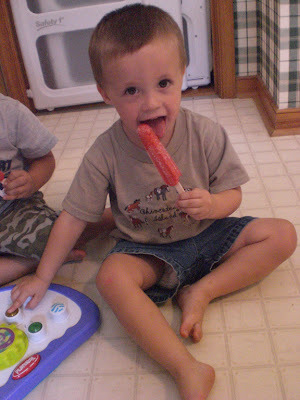 Then we went to the gym for playtime ... then to Walmart to print out some pictures ... and then we were home by 1:00. He ate a little lunch ... he's not been eating as much as usual the past few days. After playing around for awhile, he went upstairs for naptime. He didn't fall asleep until about 3:30 ... and then he didn't wake up at all. Mike was late arriving home from work last night, so at 6:30 I went upstairs to wake Griffin to come downstairs. I carried my sleeping little boy downstairs and sat in the rocking chair with him until Daddy arrived home. He still didn't wake up. Mike and I decided to just put him back in his bed and he slept all night until 6:15 this morning. What is up with that? I kept checking on him to make sure he was okay ... he was of course. I guess he was just really tired ... or growing. Who knows. He woke up this morning at 6:15, happy, rested, talking and singing up a storm. He woke up saying things he's never said before. And he's singing words to songs that I didn't know he knew. My goodness ... it's amazing what a little more rest can do for you. 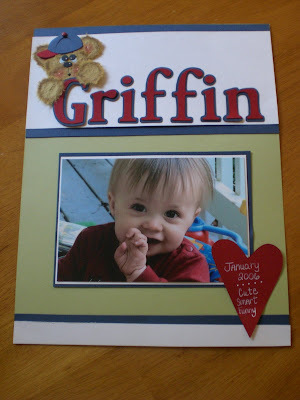 When I was working on an order earlier today, I came across this Griffin Tear Bear Title that I had made as an example. So ... after I finished the order, I decided to make a quick page. Isn't it funny ... once a layout is finished and you think it's all completed and ready for the scrapbook, you look at it and think ... oh .... I should have done this, this, this and that instead. Oh well ... I really like the way it turned out. I just wish I would have bordered all of the dark blue areas with dark red to make it match a little better. And I wish my photos would show up more clear on my blog. 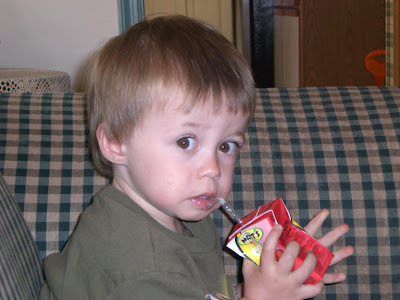 I visit many blogs where the images are so clear, but mine always show up kind of blurry. To scrapbook some personal pages! 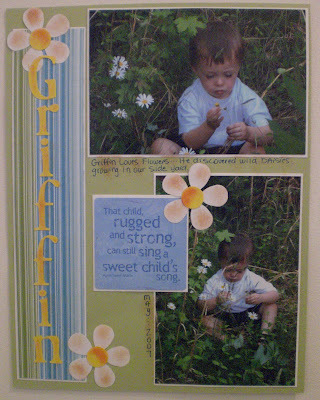 As I've mentioned, Griffin is 2 and a half years old and I did not have one scrapbook page made for him. Well ... that has changed ... let me present my first "Griffin Layout" ever!! 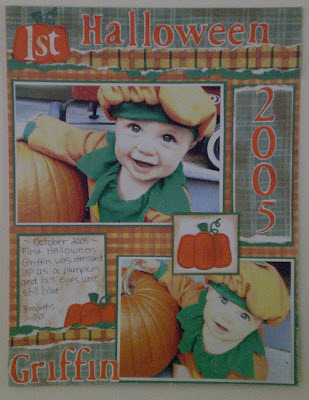 This is a layout of Griffin's first Halloween in 2005. He was 8 months old and in my opinion the cutest little pumpkin ever! I had so, so, so much fun making this layout. I'm really excited about this, ya'll. 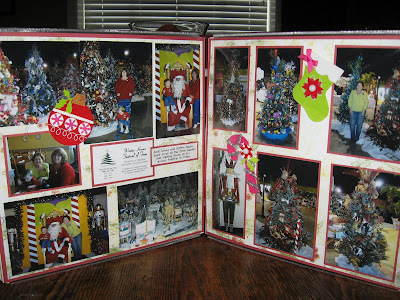 I will be scrapping at least ONE personal scrapbook page a week ... and I plan to share them with you here. * I really like the top loading albums. That way I can scrap the pictures I want to in no particular order. Hey Jen ... does CM offer anything like that? * Rarely do I use anything that I make on my own pages ... well, I never have in the past ... but with this page I did make some pumpkins using the cute little Quickutz Pumpkin die. * This is the first page I've ever used photo splits on. I love them now!! Okay ... so there you have it ... I am now on a mission to scrapbook, scrapbook, scrapbook! I am a scrapbooker ... but the honest truth is I scrapbook for everyone else and never for myself. Griffin is 2 and a half and I do not have one single page made for him. I have lots, and lots and lots of pictures ... but there they sit in the little envelopes they came in. Well ... that's changing my friends! I've been INSPIRED to scrapbook ... by my friend Andi!! I have so much STUFF to scrapbook with ... I'm making a promise to myself ... at least ONE personal scrapbook page a week ... at that rate I will have 52 done in a year!! Thank you Andi for inspiring me!! I was really spoiled this birthday ... oh my gosh ... my husband, family and friends went all out. I'm so very blessed to have such wonderful people in my life. Mike was away on a business trip in California last week ... thank goodness he was able to catch the red-eye home on Thursday evening and arrived back in Richmond on Friday morning (my birthday) at 9:00 am. Griffin and I had taken him to the airport the previous Saturday because I knew he would be flying all night and imagined he would be pretty tired Friday morning when he arrived home. Unfortunately I had awaken with my "period headache" on Friday morning ... uggh ... I really, really hate those. But anyway ... we got home from the airport around 11:00, Mike went to sleep and Griffin and I stayed downstairs for awhile. Finally around 12:30 Griffin was ready for his nap and I went upstairs with him to sleep my headache off. Honestly, sleep is the only thing that seems to relieve it. So, the entire family slept until about 4 pm. We got up and went to Red Lobster for dinner. Going to Red Lobster is a tradition for my birthday. September they begin offering "Shrimp Fest" and we love, love, love that!! So after dinner we went to the mall and Mike and I both found shoes! I couldn't ask for a better birthday (well, we COULD leave the headache out). Mike also got me the most scrumptious carrott cake from The Haywood Grille! Yumm!! The Thursday before my birthday my friend Melinda invited me to lunch. I got to choose where we went, so I asked to go to The Music Cafe in Goochland. I've never been there before and I'm glad we went. We had a really, really good time! Then Thursday evening our friends Heidi, Ryan and Evan invited us to dinner for my birthday. So, we all went to Red Robin. I've mentioned it before ... but I just love going there ... it's so kid friendly!! I received SO many nice emails, e-cards, phone calls, gifts and well wishes ... I just wanted to say THANK YOU from the bottom of my 40-year old heart!! Oh ... and today is my Daddy's birthday!! He would have been 85. So Happy Birthday Daddy ... I know you and Momma are up there in heaven having one heck of a party!! I had several questions in my comments about Sherri Shepherd joining The View. Basically most folks that don't watch seemed confused thinking Whoopi Goldberg was joining and wondering why Sherri was joining as well. Two seasons ago they had had Meredith, Star, Joy, Elisabeth and Barbara. Meredith left and Rosie O'Donnell replaced her. Then Star Jones left shortly after, never to be replaced last seaon. Now, Whoopie is replacing Rosie as moderator and finally they are replacing Star Jones with Sherri Shepherd. I'm so happy with this panel now. I truly think it's a great group of women, with their own views and NOW these folks are willing to listen to everyone else's point of view without making everything political. Honestly, I watch The View for the hot topics, celebrities and fluff. If I wanted to watch a political show I would turn to Fox News or CNN. Granted, they do have their own political views on things ... but thankfully they have chosen to share those in only one segment of the hot topics section. So to Whoopi, Joy, Sherri, Elisabeth and Barbara ... yes ... I will take a little time to enjoy The View each and every day! I am so, so excited that the new co-host of The View is Sherri Shepherd. I was really hoping she would get it. On Monday ... Barbara Walters announced that yes, indeed Sherri was the new co-host! Woo Hoo!! I could not find a non copyrighted picture of her to share ... so if you are unfamiliar with Sherri ... stop by her website Sherri Shepherd's Website to see who she is. I can totally relate to Sherri ... she turned 40 in April, I will be 40 in just a few days ... she has a young son ... she's a curvy woman ... and she is just so REAL. I love, love, triple love her!! It's been awhile since I've posted ... so I saw this list of favorite things on Andi's blog and thought I would blog lift it and share some of my favorite things too. Seriously ... when I am downstairs and Griffin is upstairs and he is running. I love the pitter patter sound of his little feet. And I LOVE the sound of his giggles. Fresh Cut Grass and Fresh Baked Bread. Fall ... and now that we live in Virginia ... it's spectacular! I love the colors of fall ... I love how the air gets cool and crisp ... and I love the holidays related to fall as well. Nora Roberts ... I LOVE HER! If I'm honest ... I will say potato ... cooked anyway. Chase the Griffin ... LOL. I love the way Happy (Liz I think) smells ... but I can not wear perfume (burn candles or have potpourri either) since having Griffin. Strange huh? This is a tough one for me because I've been on a shoe hunting quest for awhile now. I'm looking for some great leather fall/winter closed in shoes ... can't seem to find what I'm looking for. Maple Nut Goodies ... yum! Scrapbook paper ... I just love scrapbook paper!